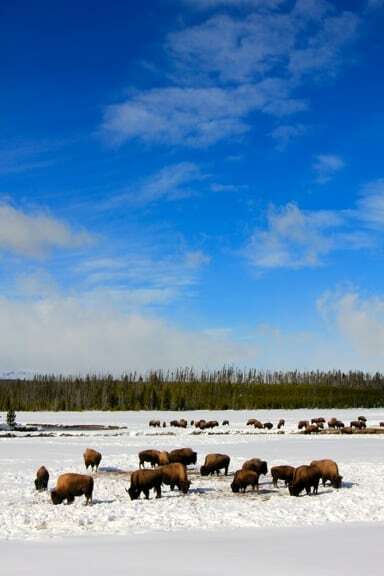 Our last day in Yellowstone National Park on Off The Beaten Path’s Winter Wonders Tour was by far my favorite. For one, the clouds and snow that had dominated the previous four days finally cleared, revealing the “Big Sky Country” for which the state of Montana is known in all its glorious splendor. For another, we explored the park’s Lower Geyser Basin, which was full of amazing, otherworldly sights. 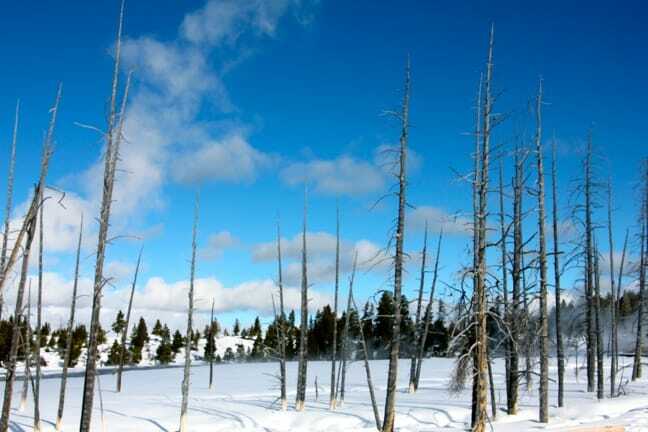 These dessicated trees, which are essentially corpses preserved for eternity by the Yellowstone Caldera’s calcium carbonate deposits, were just the tip of the iceberg. 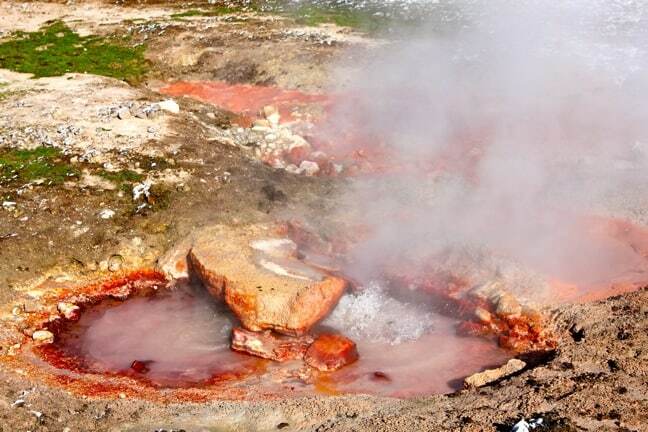 One of our first memorable sights in the Lower Geyser Basin was the Fountain Paint Pots, whose reddish tint reminded me of Georgia clay, but whose phosphorous odor and bubbling boil reminded me more of Wesley and Buttercup’s trek through the Fire Swamp in The Princess Bride. 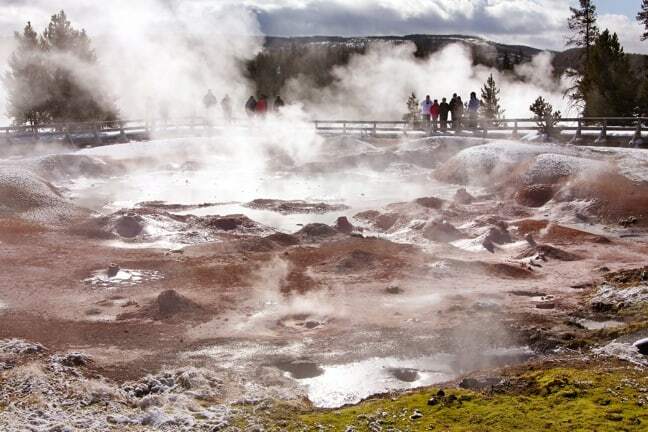 The rising sun’s light streaming through the steam coming off the pots definitely lent an otherworldly appeal, eerily shrouding our fellow travelers on the other side of the distinctive geothermal feature. That rising steam created what I thought was one of the coolest features of the Lower Geyser Basin. 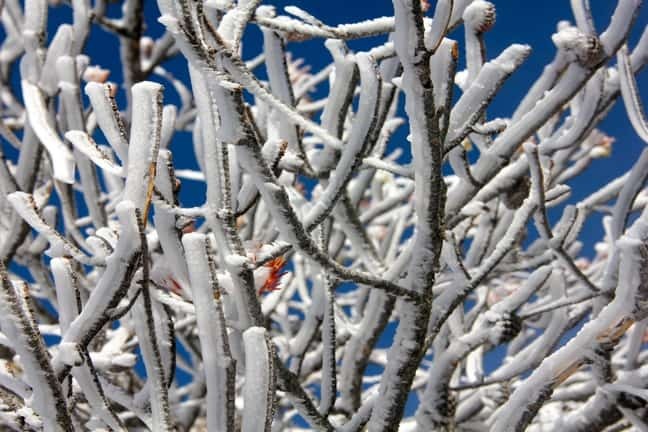 As the steam rose off the boiling hot springs and bubbling paint pots, it met with the frigid branches of frozen trees, where it turned into a thick layer of vertical ice that was like nothing I’d ever seen. This is one of my favorite Yellowstone photos, thanks to the striking contrast between the icy branches and vivid blue sky, not to mention the subtle splash of fiery color hidden in the tree. 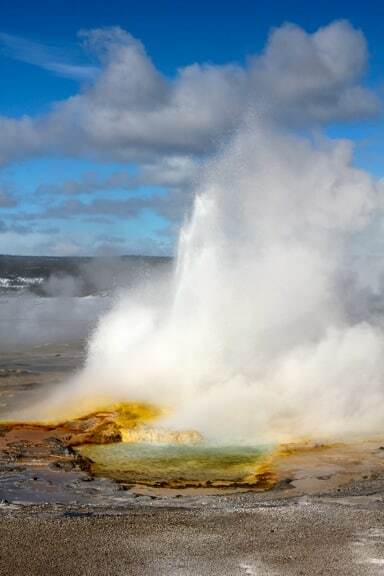 The Lower Geyser Basin may not have had a world-renowned tourist attraction such as Old Faithful, or one as over-the-top as the Upper Geyser Basin’s Grand Geyser. But it made up for it in quantity: At one point, we watched Clepsydra Geyser erupting at the same time as two other geysers, so that we could literally see eruptions no matter which direction we turned. With brilliant blue skies that made the geysers’ colors seem to glow, our last day in Yellowstone National Park offered one heck of a show. It wasn’t even lunchtime yet, but I was already getting a bit wistful about our last day in Yellowstone. 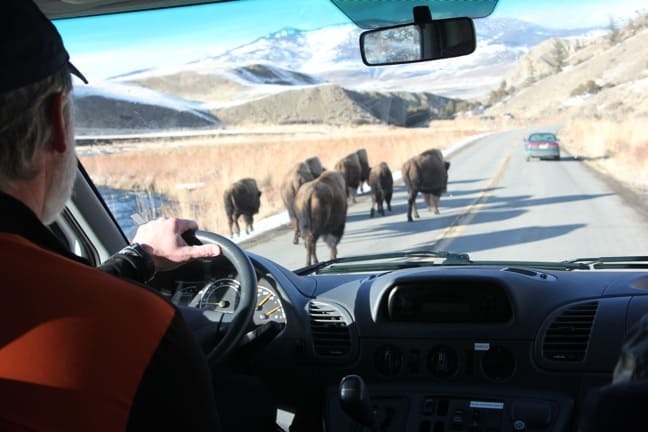 We’d seen hundreds (if not thousands) of American bison over the course of our time in the park, but there seemed to be more of them than ever on day five, and closer to the road than we’d seen herds before. And seriously, could that gorgeous sky have been any bluer? A number of the people in our tour group went inside to eat lunch at the small station at the base of National Park Mountain. But, knowing our time in the park was drawing to a close, I couldn’t let a minute of the beautiful day go to waste. 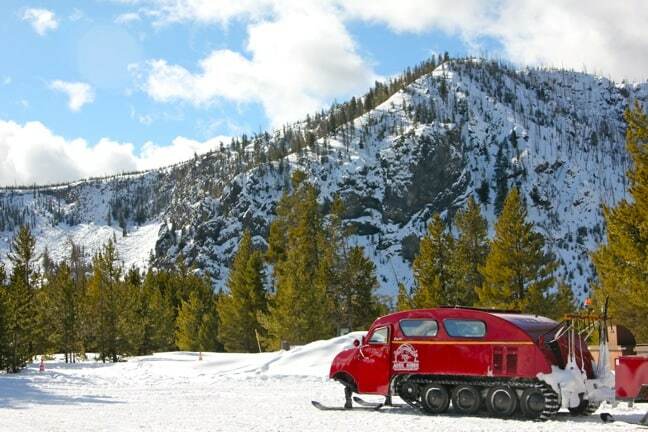 I sat outside on a frozen log, savoring the spectacular view behind our Alpine Snowcoach. After eating, I hiked a few hundred yards to get a better view of the mountain, only to see yet another expansive bison herd feeding on the grass near the mountain’s base. We’d seen several waterfalls (including a couple that were almost completely frozen over) during our time in the park, but Mystic Falls was arguably the most impressive. With light and clouds creating a striking contrast on the surrounding hillsides of the Rocky Mountains, the waterfall was perfectly lit by the midday sun. I’m guessing at another time of year these waters might provide a refreshing dip for people (and wildlife) sweltering in the summer heat. But, for us, it was a symbolic representation of life amidst the harsh, frozen land that is Yellowstone in Winter. This is quite possibly my favorite picture from Yellowstone. Emerald Spring‘s water boasts the sort of rich colors you expect to see in some tropical Caribbean haven rather than surrounded by ice and snow. 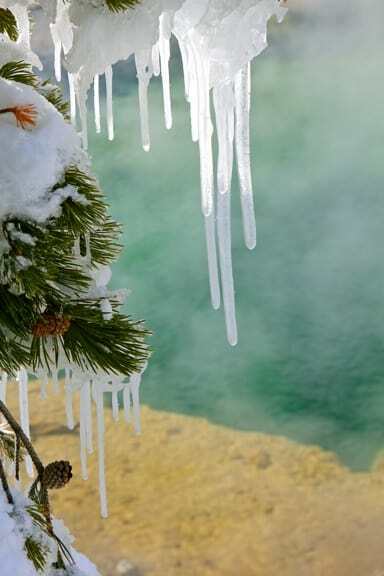 The boiling hot waters create a hazy layer of steam as they meet the cool air and, as soon as I saw these massive icicles hanging from a nearby pine tree, I knew it would make the perfect framing device. There’s a horizontal version of this shot that really emphasizes the spring, but I love the close-up of the pine cones and the sun-drenched icicles even more. We’d seen all sorts of animal tracks during our time in Yellowstone– from moose, elk and bison to coyotes and wolves– but I’d never seen tracks like these before. 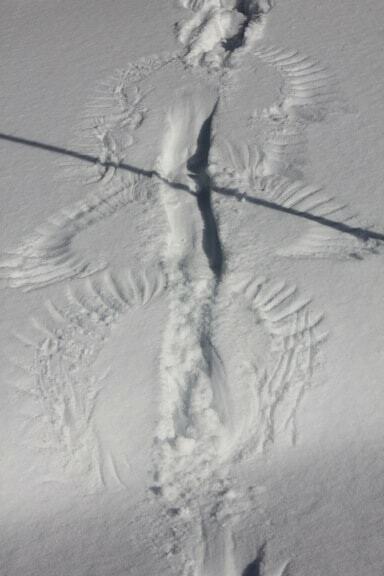 Even our guide, Kurt Westenbarger, seemed amused by the sight, and wasn’t exactly sure how to explain what were obviously feather tracks in the snow. They reminded my daughter, Alex, of little miniature snow angels, which she’d been dying to make since we got to Montana. We began to suspect a culprit when we noticed this massive crow nearby. 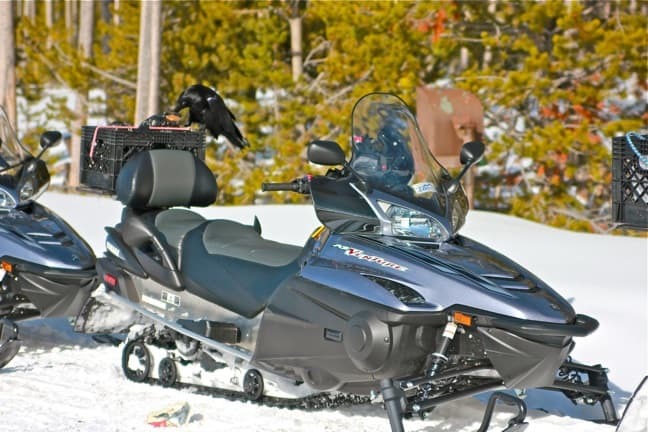 Normally I find crows a nuisance, but in Yellowstone they pale in comparison to the vast herds of snowmobilers, whose extremely loud noise shatters the peaceful serenity of being out in the middle of the Rocky Mountain wilderness. So our little group was amused and delighted as we watched this guy heisting his lunch from the back of one of the snowmobiles, and elicited a groan of disappointment when the snowmobilers came back just before he could make a getaway with his haul.